So, typically I'll post a picture of my empty bottle when I'm done with one. After all, I don't review anything until I've at least given it a bottle's worth of a try, rather than just a single pour. With this particular bottle, however, due to a late night on my front porch with my neighbors, the empty seems to have gone missing. Odds are it ended up in my neighbor's recycling bin as part of our late night clean up efforts. In any event, I just don't have my typical empty bottle picture for this post. So, I used a nice picture of a half empty bottle I found on the internet. I've never had Kentucky Spirit before, so maybe it's unfair that my first bottle is a store pick. That being said, perhaps I ran the risk of loving it more than necessary, as Warehouse Liquors has made some absolutely incredible private picks in the past. 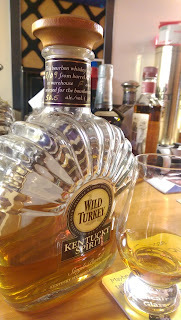 Nonetheless, having tried most all of the regulars from Wild Turkey, I was excited to finally give this one a go. This whiskey smells great. It has a bunch of cinnamon on top of a consistent layer of vanilla. However, it has that familiar Wild Turkey funk to it, a slightly musty or tobacco flavored scent to it that is familiar and inviting. Although I've only had the cereal a couple times, I couldn't help but be reminded of Cinnamon Frosted Flakes with each whiff I took. On the palate, in addition to the cinnamon and vanilla that I expected, the first flavor I noticed was a distinct almond flavor, like an amaretto liquor. That flavor seemed to go perfectly with the cinnamon to give this whiskey a nice bite, different from the alcohol bite you get from higher proof whiskeys. This was more of a tangy bite. It also had a bit of a piney quality that added a bit of earthiness to it, the kind of earthiness I tend to associate with Wild Turkey products. The cinnamon is also not the typical sharp cinnamon of a rye or even a high rye bourbon. Even that had a certain dank or musty quality to it. Nonetheless, overall this is a sweeter product than most Wild Turkey products I've had. Despite all the earthy qualities, it also has a sweet, honey like quality to it that seemed to balance everything out with the perfect amount of sweet, spicy and savory in each sip. Once again Warehouse Liquors made a fantastic pick, and I only wish I had more. This whiskey ran the gamut of flavors, and yet it did so on a very well-balanced manner. I only wish I had my empty bottle shot as a memento.